Scientists know that a warming climate can be expected to gradually sap oceans of oxygen, leaving fish, crabs, squid, sea stars, and other marine life struggling to breathe. But it's been difficult to determine whether this anticipated oxygen drain is already having a noticeable impact. 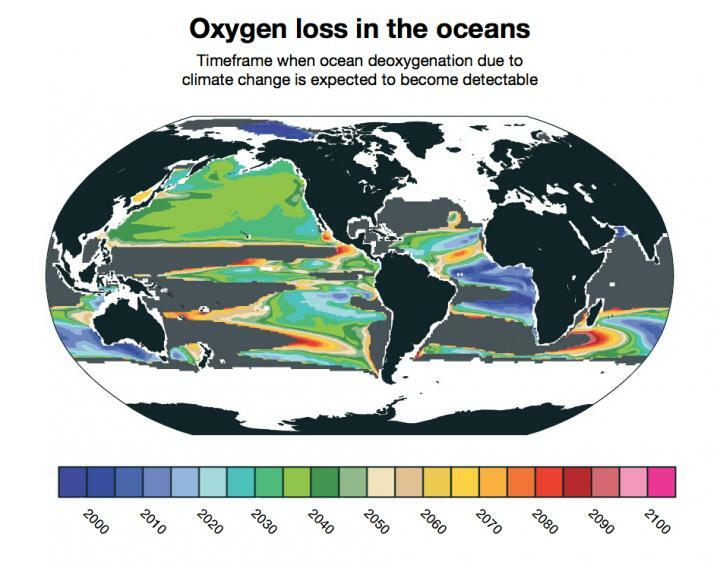 "Loss of oxygen in the ocean is one of the serious side effects of a warming atmosphere, and a major threat to marine life," said NCAR scientist Matthew Long, lead author of the study. "Since oxygen concentrations in the ocean naturally vary depending on variations in winds and temperature at the surface, it's been challenging to attribute any deoxygenation to climate change. This new study tells us when we can expect the impact from climate change to overwhelm the natural variability."